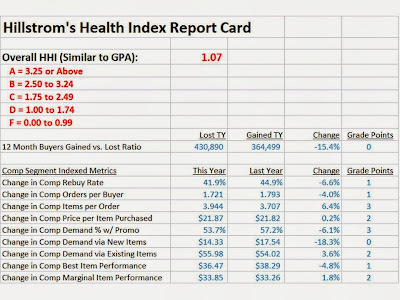 Kevin Hillstrom: MineThatData: Hillstrom's Health Index (HHI): An Offer For You!! Hillstrom's Health Index (HHI): An Offer For You!! Here's a problem that comes up, repeatedly. Each business has a series of metrics that are routinely evaluated. Some of the metrics look good, some of the metrics look bad. Is the customer file healthy, or is it unhealthy? I'd like to introduce a new product, called "Hillstrom's Health Index", or "HHI". Think of this metric like you would think of a grade point average in college, or high school. If a metric is good, it earns a grade of "A", and receives four points. If a metric is terrible, it earns a grade of "F", and receives zero points. Each metric is weighted, according to the importance that the metric has to the health of the customer file. New customers, of course, are terribly important - so you have to acquire more new customers than those you lose, or you earn a poor grade. And merchandise-related customer metrics are terribly important, they lead to good/poor repurchase rates. As a result, merchandise-related metrics are weighted higher. The result is "Hillstrom's Heath Index", or "HHI" for short. In the example above, the customer file is in dire shape. This business earns an HHI of 1.07, nearly a flunking grade. The business is losing customers at an epic rate. Repurchase rates and orders per buyer are crumbling. 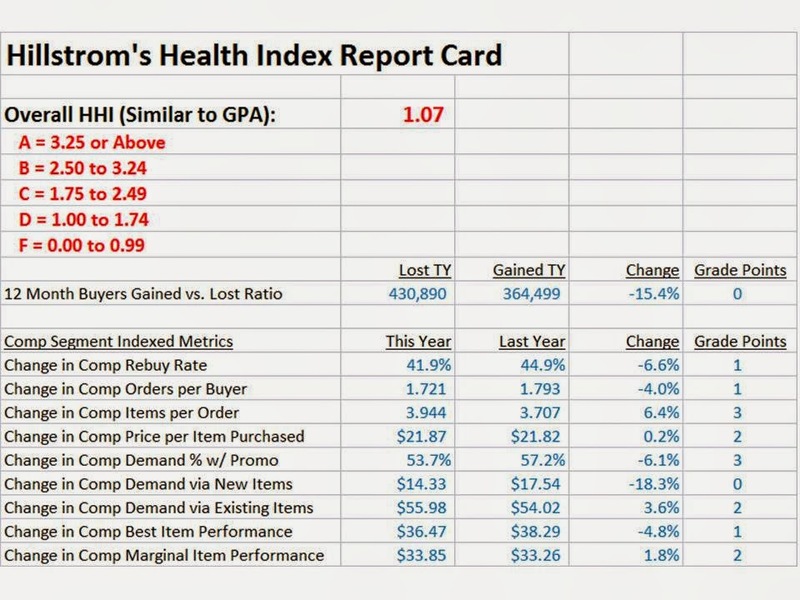 As we look down the report card, we notice that demand from new items is the worst performing metric. Demand from existing items, however, is on the increase - clearly, customers are not getting the new product diet they want, and are shifting demand as a result. Also notice that demand from best-performing items is on the decline. This business is generating volume from marginally performing existing items, with everything else crumbling. One other good metric - only 54% of demand is generated via discounts/promotions, compared to 57% a year earlier. Notice that the metric is graded well. I've analyzed numerous businesses through this framework - with HHIs ranging between 1.07 (a catastrophe) and 3.40 (from a rapidly growing, existing catalog brand). I'd like to test the framework with additional data, before releasing the algorithm as a product. And having said that, allow me to mention three common complaints I receive from you, the loyal reader. "I just wish you offered free products from time to time. Free is good!" "My business is too small to afford your services, I wish you had a product that was affordable and could help me make actionable choices." "We read your blog all the time, but our CMO wants to try working with you on a trial basis before committing to a large project." Ok, your concerns have been heard. Here's a chance for you to "step up", as the pundits say, and follow through on your requests. I am offering two choices while testing this product, prior to releasing it at full price. Option #1 = For $2,900, I will run your data through the HHI Algorithm. You'll get to see how your business stacks up against the metrics listed above, as well as a series of comp segment metrics (metrics not published in this post). Your business will earn a grade (A/B/C/D/F - based on the grade point average, or as I am calling it, the "HHI"). You will get recommendations on how to fix any problems, and you'll get praise for the things you're doing well! Option #2 = For FREE, I will run up to TWO companies through the HHI Algorithm. You get a free analysis, however, you agree to have your name, your company name, and results analysis published on this blog as a case study. You will be interviewed, and your findings and comments will be shared with at least 7,000 blog subscribers, Twitter followers, and site visitors. If you've been sitting on the fence, looking for an opportunity to get in on the action, then this is your opportunity, why not take advantage of it? Click here to obtain the file layout necessary to complete this analysis - only File #1 is needed to complete an HHI project. Then email me (kevinh@minethatdata.com) to get your project loaded up in the queue. That is a unique index. Is it what you have designed yourself ? That is correct, I designed it myself.